When natural remedies were the only available options, warm-water immersion was the best solution for muscle and joint pain. Many hundreds of years later, it’s still considered a very effective treatment for a wide range of musculoskeletal issues – and a hot tub is one of the most convenient ways to get it. Why Does Warm Water Help Joints? Because water is buoyant, it reduces gravity’s pull on joints. When submerged, the body weighs about 90 percent less. Weight and compression of the joints, which are often the cause of pain, are diminished while still providing 360-degree support. The warm water also raises body temperature and increases circulation, which encourages better movement. How Long Should I Soak? According to Dr. Becker’s research, the advantages of warm water immersion develop and reach their maximum benefit after about 20 minutes. Research such as Dr. Becker’s is one of the foundation blocks of the Caldera Spas 20-minute renewal blog and the wide range of personal wellness benefits associated with daily hot tub use. How Warm Should The Water Be? For joint pain relief, soak in warm water between 92 degrees and 100 degrees. How Can I Maximize Hot Tub Benefits? Use the jets! The massage you get in a hot tub releases muscle tension and increases circulation. Soft tissue becomes more flexible and movement becomes easier. 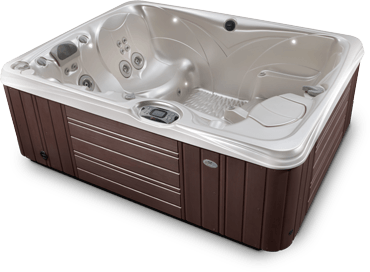 Caldera Spas hot tubs are designed to provide massage to all major muscle groups as you move seat to seat. We call it Hot Tub Circuit Therapy, and it can provide a full-body massage during that 20-minute soak. While immersed, you can also try gentle stretching and simple range-of-movement exercises that can help alleviate pain and stiffness.